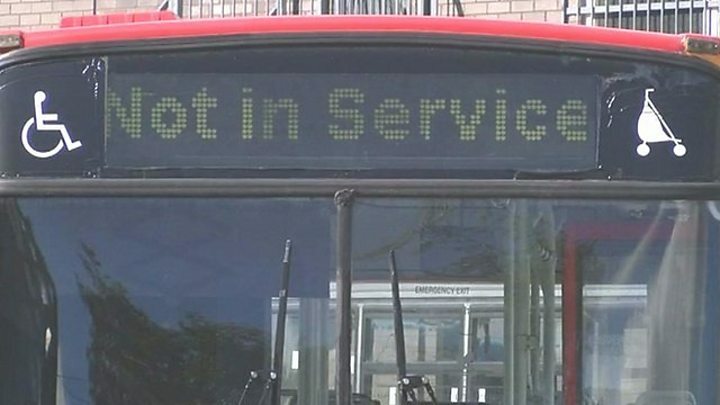 More than 300 staff have lost their jobs after a bus company went into administration. Ruabon-based GHA Coaches employed 320 people and operated 230 vehicles on school and bus routes across north Wales, Cheshire and Shropshire. Its closure has caused major disruption for passengers. Jason Bell of administrators Grant Thornton said: "We will explore all options in terms of bringing any part of the business back to life." The company recently received a winding-up petition from HMRC in respect of unpaid taxes. Attempts by the directors - Gareth and Arwyn Lloyd Davies - to secure an emergency funding package proved unsuccessful and the company was placed into administration on Wednesday. "Our immediate responsibility is to look after the interests of the creditors," Mr Bell added. "We are also liaising with the local authorities involved on contingency arrangements for the routes affected." Workers - who first received the news by text - have expressed shock at the closure. Denbighshire, Flintshire and Wrexham councils have put urgent contingency plans in place to minimise disruption for passengers. The authorities say they have given priority to school transport services, putting on replacement buses. Wrexham council said it was "very concerned" at the news. GHA operated up to 30 public routes in the county, none of which ran on Thursday. "Our priority at the moment is to ensure that our statutory services such as home to school transport are maintained and all pupils get to school," said a spokesman. "With regard to the regional transport services provided by GHA, we are working with other authorities across the north west and north Wales to mitigate the disruption. "We are confident other operators will take on some of the routes." Denbighshire council said it provided alternative transport to 95% of the pupils affected by the closure. Out of the 28 public services GHA ran in the county, only four were running on Thursday. "The council is using its contingency plans to try to ensure that as many former services as possible run by GHA are able to continue to operate by other suppliers on a temporary basis," it said in a statement. "There will be some gaps in service, as it will take a few days to arrange the necessary vehicles from other suppliers." Flintshire council said no public services would be covered immediately but it was working to cover them as soon as possible. GHA also operated a handful of services in Gwynedd and Conwy and, over the border, routes in Cheshire West and Chester, Cheshire East, Warrington and into Greater Manchester council areas. Lloyds Coaches has been brought in to run the Welsh Government-funded Traws Cymru route between Barmouth, Dolgellau, Bala, Corwen and Wrexham. A Welsh Government spokeswoman said: "We have for some time been working with local authorities to try to protect the bus network provided by GHA Coaches. "We will continue to work collaboratively to minimise any adverse effects of the company entering administration." It is the second large Welsh bus company to close after Pembrokeshire firm Silcox collapsed in June. In south Wales, drivers at Newport Bus have voted to take industrial action in a row over pay, the company said.